Love is the most beautiful and precious feeling to share with your special someone. 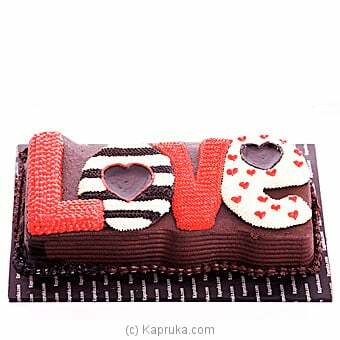 This delicious chocolate cake which spells `Love` is a cheerful and unique way to capture her heart and it is a fabulous way to say `I Love You`. Kapruka cakes are freshly baked exclusively for you daily using the right blend of fine and premium ingredients. The exceptional creativity, the presentation and the careful packing along with the best affordable prices of Kapruka cakes are available to you with value for money and standards beyond imagination.